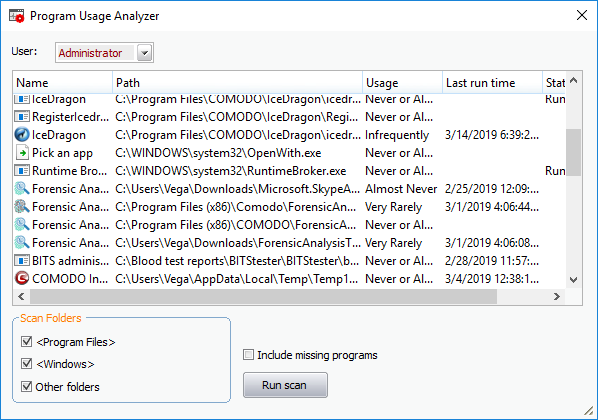 The usage analyzer shows useful information about programs that are running, or have run on your computer. 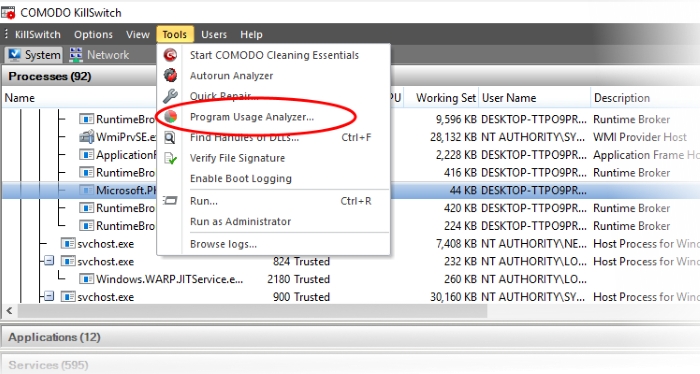 Alternatively, click the program usage analyzer icon in the tool bar. The title of the program/application. Click the column header to sort entries in alphabetical order. The location of the program's installation folder. How often the program is run by the user. Date and time the program was most recently executed. The current runtime status of the program. User – Choose which user's programs are shown. Scan Folders - Choose the folders from which the list of programs is drawn. Include missing programs + 'Run Scan' – Finds programs and Windows components which were uninstalled from the computer. Right-click on an entry to open the installation folder of the program and access the process invoked by the program. Open Containing Folder - Opens the installation folder of the program in Windows Explorer.